What is Sagittal? See the article Belly Dance in 3D. Posture and some of the building blocks are covered on both the Sagittal Circles and Vertical Circles DVDs. The duplication is to allow the student to start with any Level 1 DVD in the series. For a complete chart showing all the moves covered in Level 1 and which DVD they are on, please see the BDfEB ~ Level 1 page. From the back:Have you always wanted to belly dance but held back because you don’t “look like” a belly dancer? Or have you tried belly dance but were frustrated because your body type was different from the instructor’s so your moves didn’t look the same? 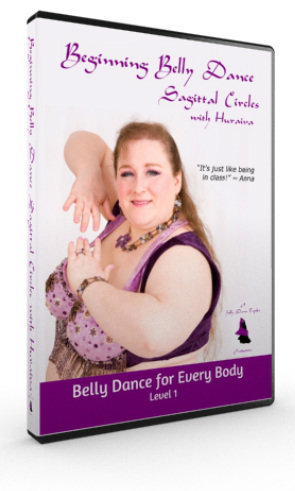 The instructional DVD series Belly Dance for Every Body was created with you in mind! It doesn’t matter what your body type is - you can be thick or thin, large or small, tall or short - anyone can belly dance beautifully. Huraiva is a plus size dancer with years of experience teaching all shapes and sizes to belly dance. In Level 1 of this series, you will realize your potential and take the first steps towards learning an ancient dance form celebrating women of all body types. In this DVD, Beginning Belly Dance: Sagittal Circles, you will learn proper dance posture essential for safe and beautiful dancing. And with practice, it will carry over to your everyday life, leading to better posture and carriage overall! Graceful arm positions and basic dance movements are the building blocks which combine to create sagittal circles. As you learn each step, you will combine it with a previously learned movement creating short combinations so you can see how everything fits together. Take your first step towards learning this dance form rich in traditions, and handed down through the centuries. Are you ready for Belly Dance for Every Body? $20 for just the DVD or $23 for the DVD, Study Guide and Student Manual. Plus shipping of $4 for US orders and 8.8% sales tax for Kansas Residents. Need more information? Keep reading. Also includes a section on musicality focusing on the Masmoudi rhythm. But that isn't all that is available. If you order from this website there is also a Premium Package available that includes a study guide, to help you get the most out of your DVD, and a copy of Huraiva's Beginning Belly Dance student manual. Both of these resources will help you progress in your dance. Beginning Belly Dance Sagittal Circles Study Guide includes helpful tips for creating the movements more easily plus exercises you can do to help you gain confidence in your movements making them more beautiful so you can execute them with greater ease. Purchased separately, the Study Guide is available for $15. Beginning Belly Dance Student Manual includes a list of all the moves covered in the Beginning Belly Dance course, for both in class study and study by DVD. There is space for you to write a description of each move in your own words to help reinforce learning. The manual also includes articles on various belly dance topics and information on outside resources to supplement your learning. Purchased separately, the Student Manual is available for $10. Level 1 Three Circles Combo Pack. Beginning Belly Dance Horizontal Circles & Sagittal Circles Combo Pack. Beginning Belly Dance Vertical Circles & Sagittal Circles Combo Pack. Shipping of $4 for one DVD plus an additional $1 for each additional DVD will apply for US orders. If you want to order more than one copy of a specific DVD, or to place an international order please email for a shipping quote and personalized invoice. Bulk orders for resale (minimum of 10) please email for wholesale pricing. A link to the digital downloads for the study guide and student manual will be emailed within 24 hours of ordering. DVDs will be shipped within 3 business days of ordering.